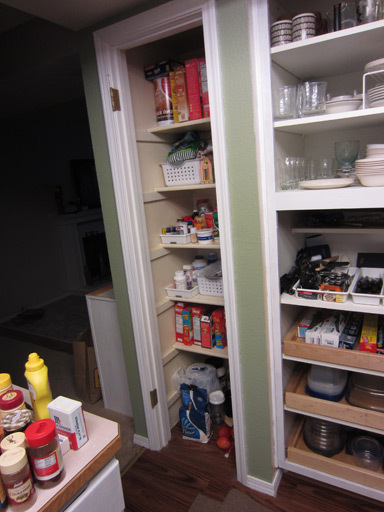 Our kitchen includes a narrow pantry. Judging by the craftsmanship, it was probably some previous owner’s project. All they did was nail some thin strips of wood to the walls and set shelves on top. Not bad. I would’ve done it differently, but I don’t have bandwidth to change it up significantly. So I’m going to just give it a makeover, rather than complete cosmetic surgery. First thing I did was pull all our food out and put it in the living room. 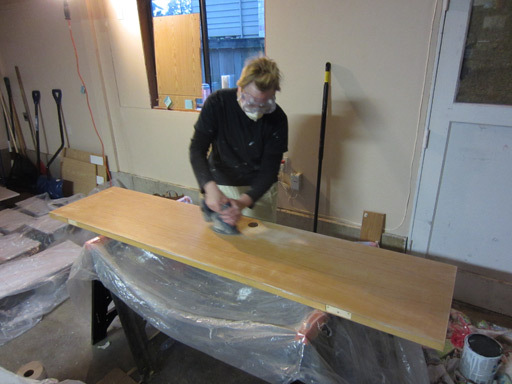 Jim worked inside, deglossing the pantry interior and shelves while I got to work on sanding the pantry door. Next up: priming the door, the shelves, and the interior of the pantry. All told, it only took about an hour and a half or so to accomplish all that and get back to the “waiting” step as it all dries! Best of all, these were the last primer-related steps. On to enamel!